The rolling hills and lush green valleys of Kandy attract a number of travellers, both local and foreign, to its cooler climate and scenic locations. One of its most celebrated and revered highlights are the magnificent, Temple of the Sacred Tooth Relic, a 17th-century temple located in the heart of the city. A 3-hour drive from the commercial capital, Colombo – visitors to Kandy have the choice of travelling by one of several forms of public transport, or can even opt for a self-driven vehicle rental in Sri Lanka. There are several reputed companies such as Casons Rent a Car, for example, that provide safe and affordable vehicles. The Temple of the Sacred Tooth Relic or as it’s known in the local language, ‘Sri Dalada Maligawa’, houses a tooth relic which, according to Buddhist chronicles, belonged to Lord Buddha. The temple and its precious relic draw thousands of Buddhist pilgrims daily, bearing sweet smelling blossoms, to lay as offerings near the sacred shrine. The tooth relic has also played a huge political role in the country’s history. 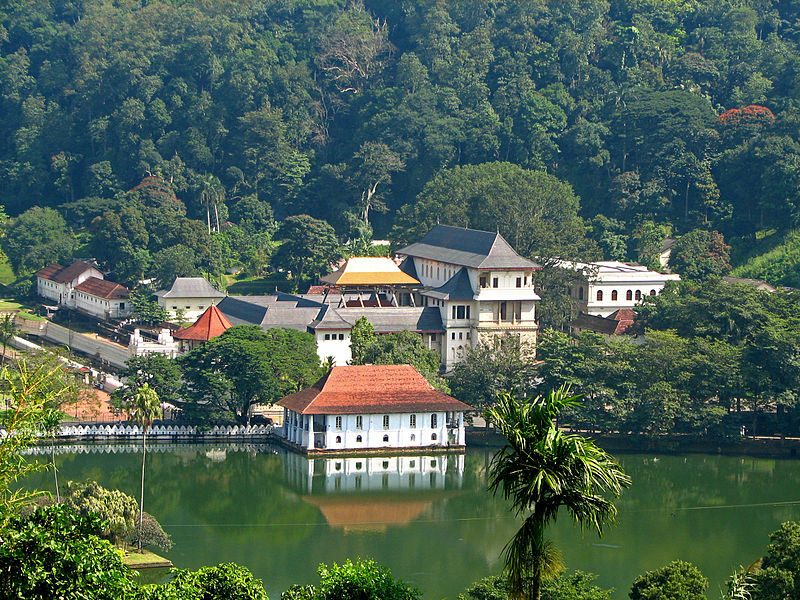 It was believed by previous rulers that the custodian of the relic held governance over the entire island, and thus, with each king, the tooth was moved across the island until it found its permanent home in Kandy with the last King of Sri Lanka. The temple is located within the premises of the former royal palace complex; the plain white walls and a simple red roof are a stark contrast to the highly detailed interior which features detailed carvings and décor created out of ivory, wood and lacquer. The relic is kept within an inner shrine, tucked away behind two large elephant tusks. The relic itself is hidden from view, encased in a casket adorned with jewels. Monks of the two Buddhist orders, the Malwatte and Asgiriya, conduct worship rituals daily. On Wednesdays, a symbolic bathing ceremony is held where the tooth relic is bathed with a herbal concoction made from scented water and blossoms. This same water, which is believed to hold healing properties, is distributed among worshippers. Previous Post Kandy, the hill capital.-A city among the rustic mountains of the Sri Lanka.